The Cairngorm National Park is home not only to the Cairngorm Mountain range, but also to other hills such as the Angus Glens, the Monadhliath, and lower areas like Strathspey. The park is found in Scotland’s Eastern Highlands and is filled with mountains, rivers, glens, lochs, forest trails, cosy pubs, and distilleries. It’s obvious to see why people come to the Cairngorms to get away from it all, as its vast landscapes feel a world away from bright city streets. Yet it is also easy to access some stunning nature here without much effort, such as the forest trails at Uath Lochans, or beautiful Loch Morlich. The Cairngorm plateau sits at around 1,000-1,200m above sea level, while the highest mountain in the range is Ben Macdui at 1,309m. the plateau is vast and somewhat barren, with no road inlets and just a few bothies providing shelter in the harsh conditions. 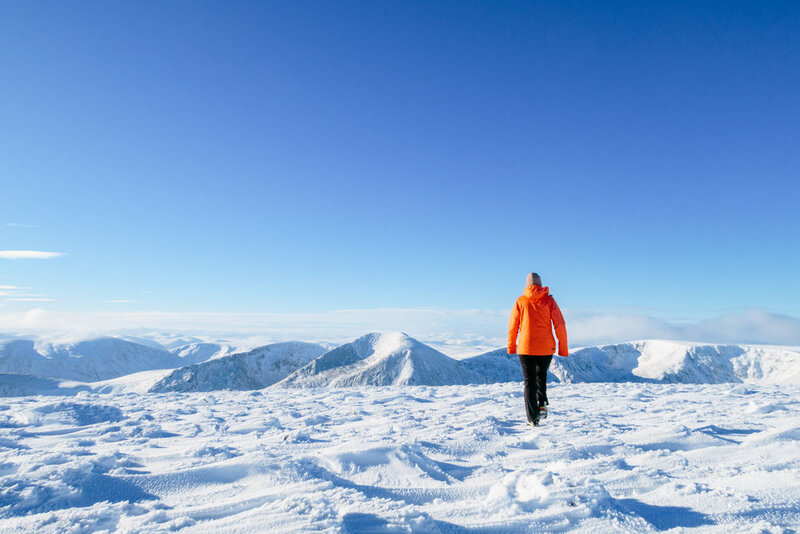 Ideal for hillwalkers, the Cairngorms are home to 55 Munros and 5 of the UK’s 6 highest peaks.The edges of the plateau are often steep, granite cliffs that make for excellent climbing, skiing and winter climbing - the Northern Corries being a hotspot in winter. These beautiful Scottish mountain-scapes are interspersed with bright mountain lochs and ancient forests of native trees, the Scots Pine being, perhaps, the most iconic. Mountain bike trails are abundant, while plenty of watersports can be undertaken on some of the larger lochs. If you’re looking to relax a little, the Cairngorms National Park is home to many a cafe, pub, and distillery, as well as the Cairngorm Brewery found in the hub of Aviemore. Visiting the Cairngorms in summer and winter can be an entirely different experience. Being the highest, coldest and snowiest plateau in Britain, the National Park is often shrouded in snow for the majority of the winter months. You might still find patches in summer, alongside the beautiful textures and colours of the rolling ranges and thick forests. The Cairngorms will provide an unforgettable, natural experience any time of year, allowing you to immerse in nature and live at one with the mountains for a while. Surrounded by rolling hills, the Ryvoan Bothy can’t be missed on a trip to the Northern Cairngorms. Bothies are an integral part of Scottish mountain culture; providing rest and shelter in Scotland’s most brutal and barren landscapes. The Ryvoan Bothy can be found by following a trail from the Glenmore Forest Park carpark, through lush Scot’s Pine forest and past the bright blue tones of An Lochan Uaine, ‘The Green Loch’ - perfect for a wild swim in the summer months. Ryvoan Bothy is small, providing the most basic shelter for a handful of hikers; with an open fire, logs for burning, plenty of candlesticks and a sleeping shelf. Only around an hour from the carpark at Glenmore Forest Park, the bothy is an ideal place to head for a wild night in the hills, without the long walk in. Hike: From the carpark at Glenmore Forest Park, follow the trail past Glenmore Lodge and through the forest. Pass An Lochan Uaine and continue until you get above the treeline. A signpost reminds you to take care as you enter mountain country, head left and the bothy can be found just up the trail. Link with a hike up Meall a’ Bhuachaille at 810m the next day and descend through the forest back to Glenmore Forest Park. Gear: For a night in a bothy, pack a sleeping mat, sleeping bag, plenty of water, food, camping stove, and head-torch — and any other essentials! A perfect introduction to the Scottish Highlands, Meall a’ Bhuachaille is an accessible, moderate hillwalk that can be reached from Glenmore Forest Park. At 810m, Meall a’ Bhuachaille is a Corbett with exceptional views.The trail is well-marked all the way up, and the hill is less remote than some of the Cairngorm’s bigger Munro walks. From the summit, you can look down to Glenmore Forest, Loch Morlich and the beautiful mountains further south. Hike: Park at Glenmore Forest carpark and follow signs to Nethy Bridge, passing Glenmore Lodge and meandering through a beautiful forest. Pass the ‘Green Loch’ of An Lochan Uaine and continue above the treeline into open ‘mountain country’. When you reach Ryvoan Bothy, take the path to the left that is well-defined to the summit of Meall a’ Bhuachaille. Head west off the summit, descending to a fork in the path. Take the path to the left that heads back into the forest to return to the carpark. See Walk Highlands’ walking guide here or use OS Map OL57. Gear: Wear walking boots and bringing warm clothing for the summit, as weather conditions can be unpredictable in the Cairngorms. Winter: Please note that when walking in winter, assess the conditions before heading out. You should always carry crampons and ice axes when heading into snowy or icy territory and be comfortable with compass navigation. A little slice of New Zealand in Aviemore, that’s exactly what you can find at Aviemore Mountain Cafe. Founded and run by an original kiwi, there are signs of the cafe’s heritage all over - from the photography adorning the walls, to the relaxed and laid-back atmosphere, to the traditional NZ cakes on offer and the selection of goods - from Vegemite to Tim-Tams - available for purchase. The Aviemore Mountain Cafe serves delicious hot drinks, cakes, breakfast and lunches, a highlight being the full breakfast (veggie or meat are both delicious! ), made from locally-sourced, fresh ingredients. Getting there: The Mountain Cafe is situated in the upstairs room of Cairngorm Mountain Sports on Grampian Road in the centre of Aviemore. You can park for free in the Tesco carpark, or there is some roadside parking and a small carpark at the cafe. Opening times: Open everyday except Wednesday. 8.30am to 5pm. A relaxing walk around Uath Lochans is an ideal way to spend an afternoon, wandering the forest trails and heading up to the viewpoint where you can see the three lochs nestled within the forest, with mountains on the horizon. Uath Lochans is protected by the Scottish Forestry Commission who have created a number of trails through the woodland, signposted with colour coded markers. We would recommend taking the trail up to Farleitter Crag, where there is an exceptional views over the spey Valley and Glen Feshie hills. Getting there: Take the B9152 south from Aviemore towards Kincraig. turn left towards Feshiebridge (signposted), pass through the village and across a bridge. At the T-junction, turn right and then soon after take a left fork. Follow the track until you find a carpark down a smaller forest track on the right. Walk: The walk to Farleitter Crag is around 2.5 miles and hilly. Walking boots may be required in the woodland after rainfall. Find more information on the trails here. The highest peak in the Cairngorms may seem like an obvious choice for a walk, but we agree that the views from the summit are simply marvellous and it is a beautiful mountain walk that you won’t regret. Ben Macdui sits right at the centre of the Cairngorm plateau, meaning it offers 360 degree views onto the surrounding mountains. The plateau is vast and barren, while the summit itself is said to be haunted by an old man. Ascend from the ski centre carpark and, if you’re feeling up for it, it’s also possible to head up Cairn Gorm on your return. Hike: The full walk is 11 miles and takes around 6-8 hours. Begin and end at the ski centre carpark. Ascend past the Northern Corries and descend via the Fiacaill a’ Choire Chais ridge. Use OS Map OL57, and a full walking guide can be found on Walk Highlands here. Gear: This is a big mountain day out, so wear walking boots and bring a rucksack with warm clothes, water, food, map, compass, first aid kit and mobile phone. In the winter, you should carry crampons and ice axe in case of difficult terrain. The Cairngorm plateau is vast and with few visible features when covered in snow, so only ascend in winter if you are comfortable navigating. 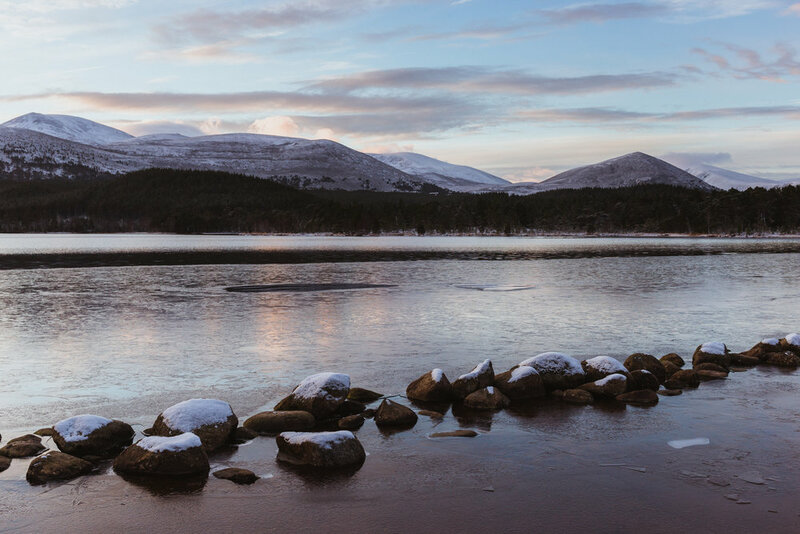 Lovely Loch Morlich lies just east of Aviemore, and is surrounded by sandy banks and lush woodland at the foot of the Cairngorm mountains. In summer, enjoy a swim in the mountain waters or wander the woodland trails that surround the loch. Have a picnic on the sandy banks enjoying views of the snowcapped Northern Cairngorms. There are plenty of watersports that can be enjoyed on the lake, such as kayaking, canoeing or SUPing. Getting there: From the roundabout at the southern end of Aviemore, head east on the B970. Loch Morlich is on the right hand side, with plenty of parking along its northern banks. We still have plenty more places to visit in the Cairngorms. The guide will be updated as we continue exploring!